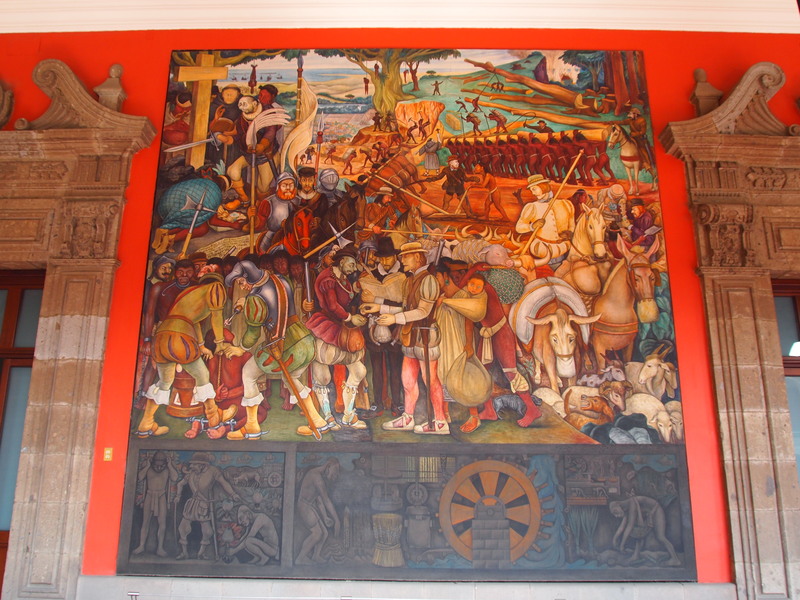 In 1519, the Spanish conquistador, Hernán Cortés, arrived on the gulf coast of Mexico. 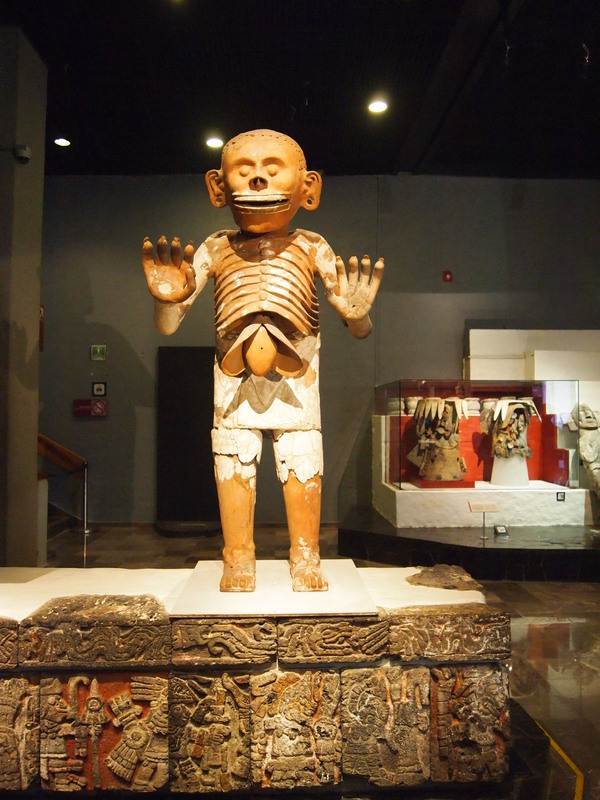 It was there that he first learned of Emperor Moctezuma II and the Mexica empire. 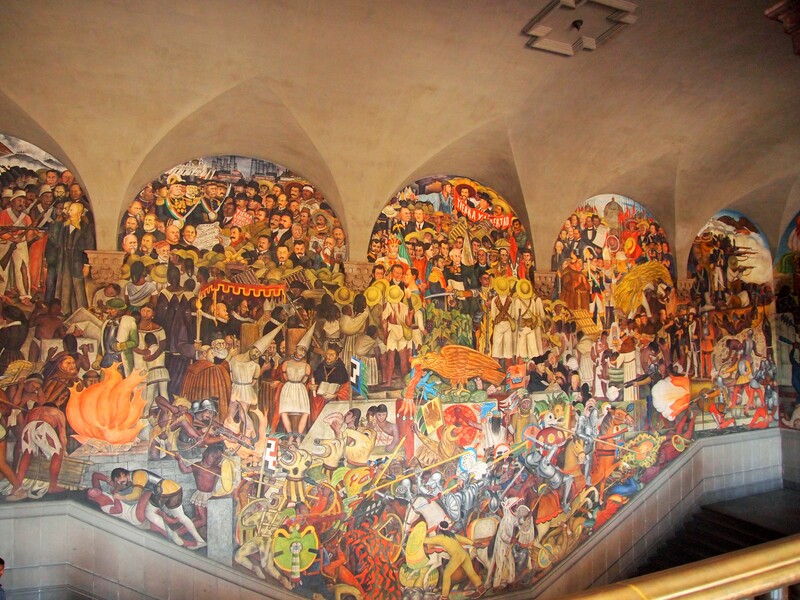 Cortés made it his mission to overthrow the Mexica and when he did in 1521, he destroyed the seat of their empire, Tenochtitlán. 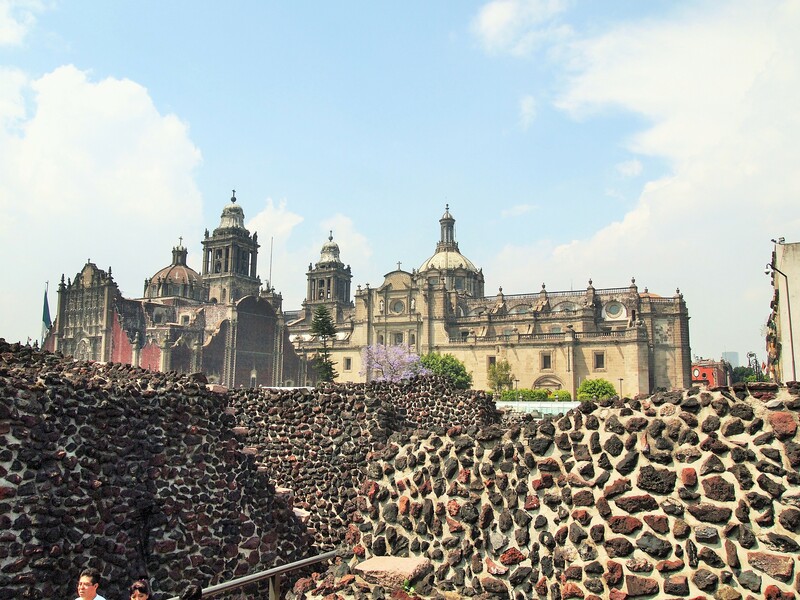 Using some of the rubble for the construction of their own buildings, the Spanish built the city of Mexico, the capital of New Spain, on the ruins of Tenochtitlán. 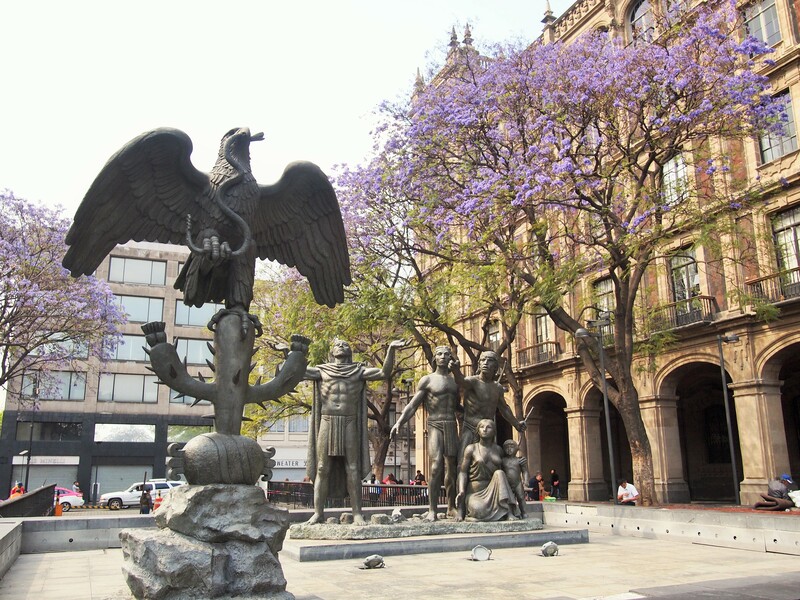 The colonial city that arose from Tenochtitlán’s ashes is now the Centro Histórico district of Mexico City. 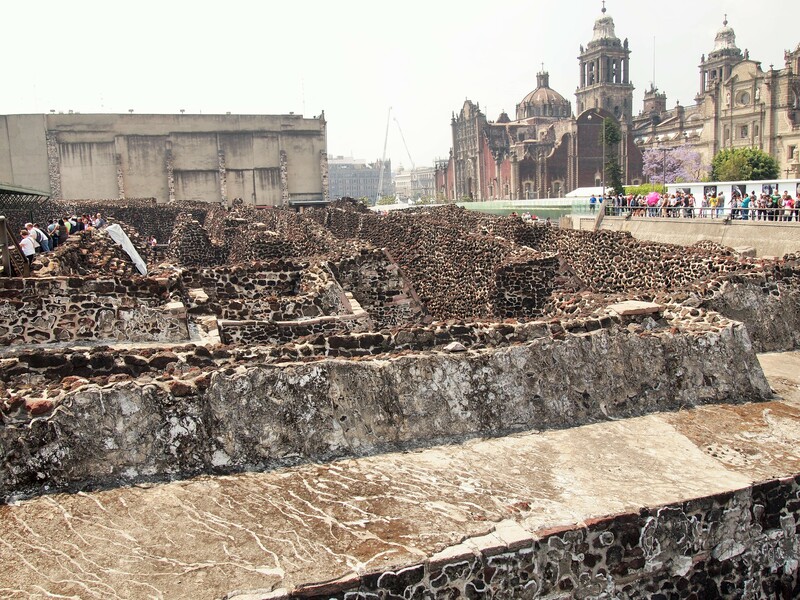 Over the centuries, Templo Mayor was covered up, first by the Spanish who leveled it, and then as Mexico City grew. 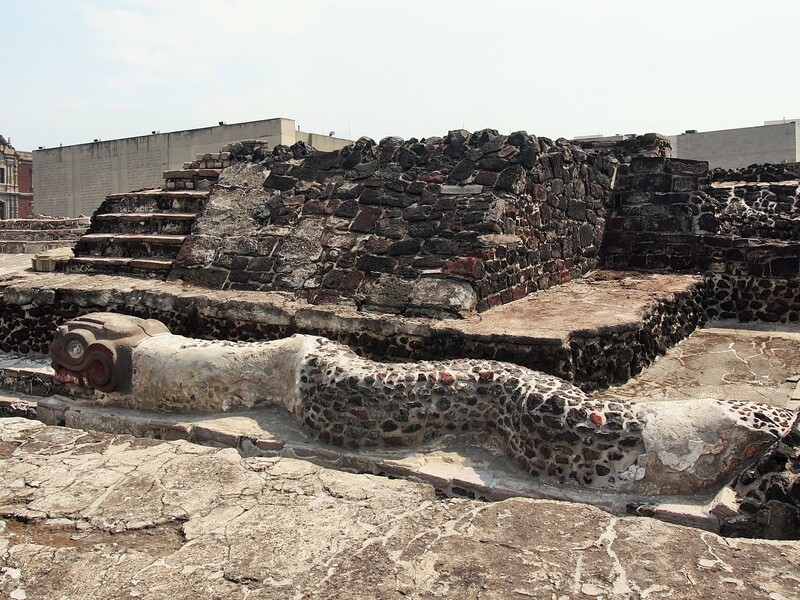 Although archaeologists speculated that the temple could be beneath the Catedral Metropolitana, it wasn’t until 1978 when workers from an electric company accidentally discovered carvings of the Mexica moon goddess that an excavation was undertaken. 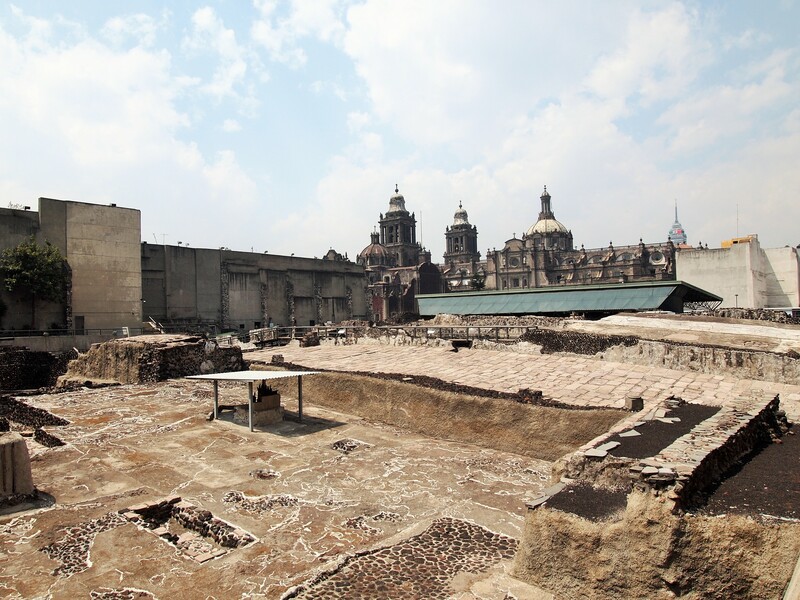 The excavation destroyed four city blocks before the base of the Templo Mayor was finally revealed. 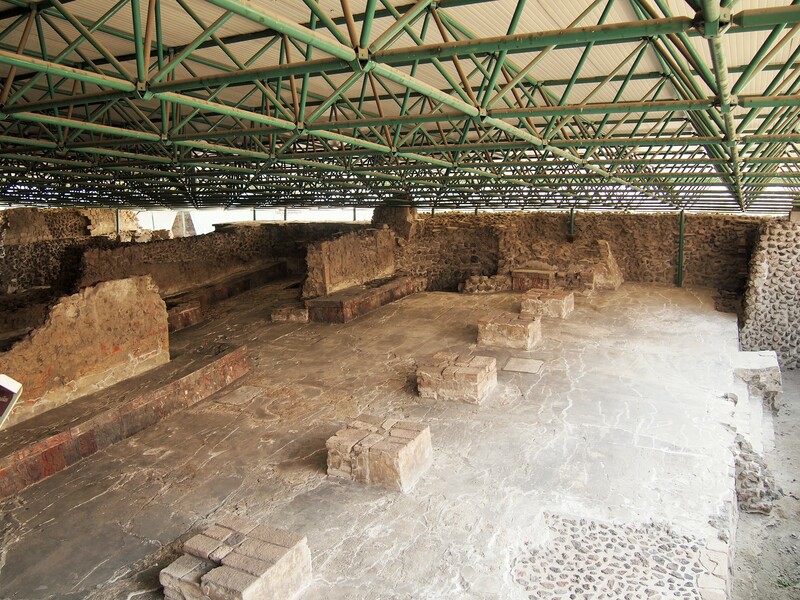 Today, visitors can walk around the base of the pyramid before stepping in the museum to view the thousands of artifacts that have been uncovered. 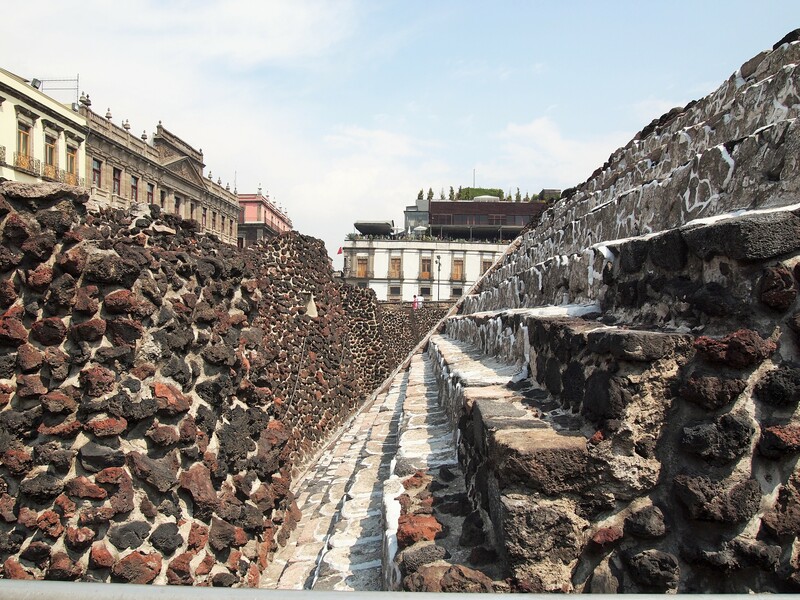 We visited Templo Mayor on a Sunday when Mexican Nationals get in free. 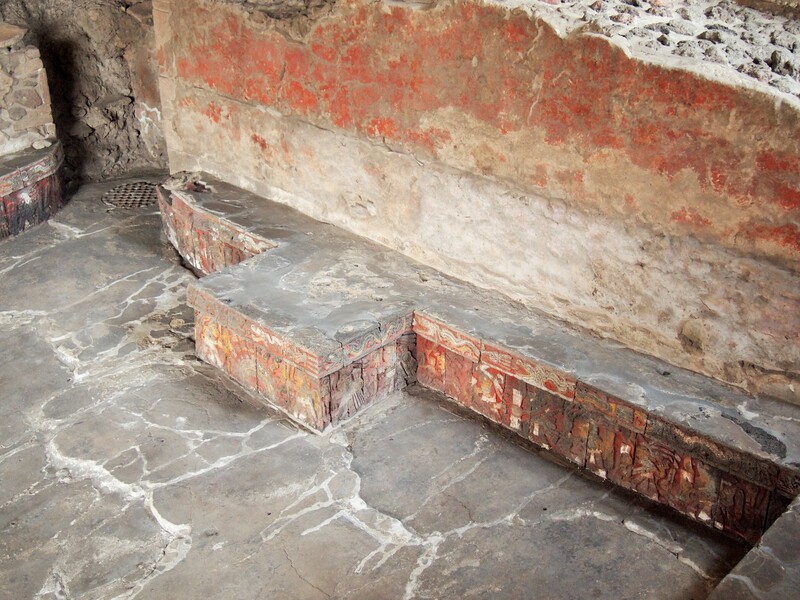 It wasn’t crowded, but it would most likely be much quieter on a week day. As foreigners we still had to pay but it was only 70 pesos or so (slightly more than $3.50). 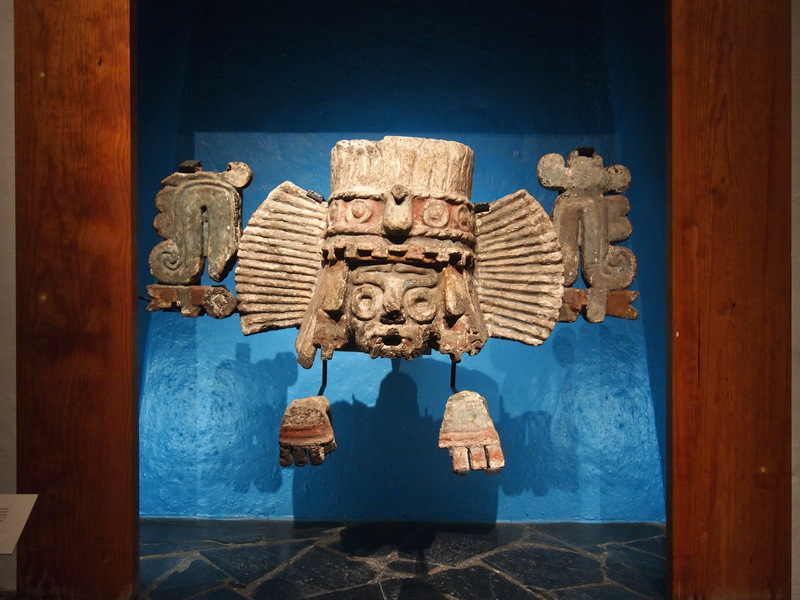 While walking through the ruins was incredible, especially near the end when carvings were visible in the House of Eagles, I thoroughly enjoyed the museum. 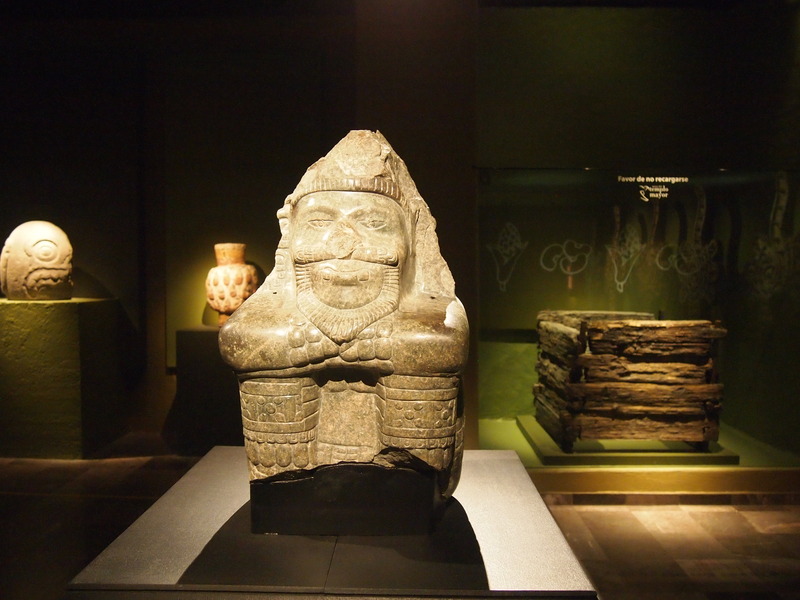 The amount of artifacts on display is astounding and many items aren’t behind glass so you can really get a feel for the size and detail of the pieces. 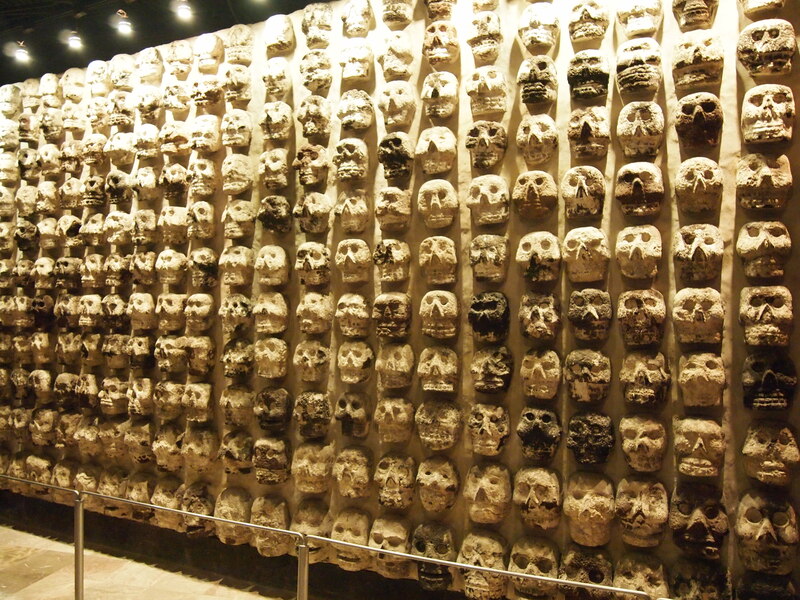 The museum had a great layout, with the different rooms and floors flowing into one another coherently. 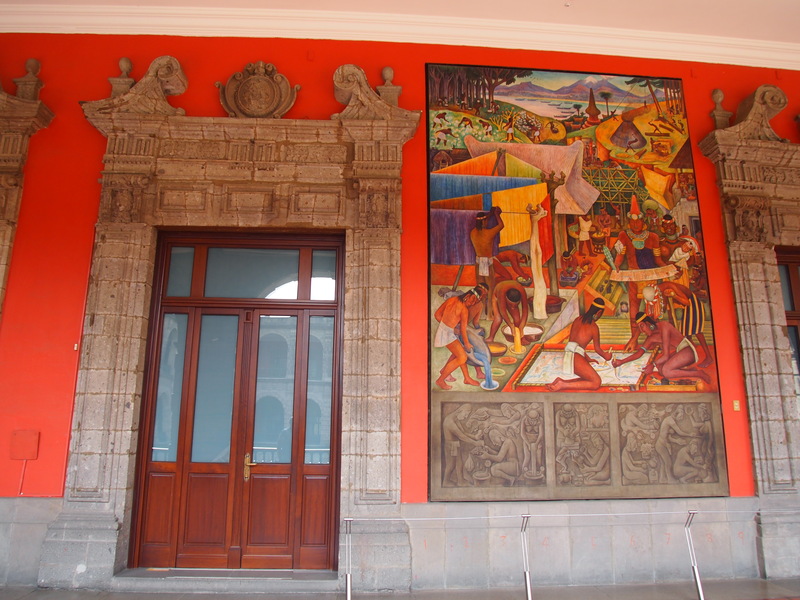 Though many of the individual descriptions were only in Spanish, the larger explanations for each room had English translations. 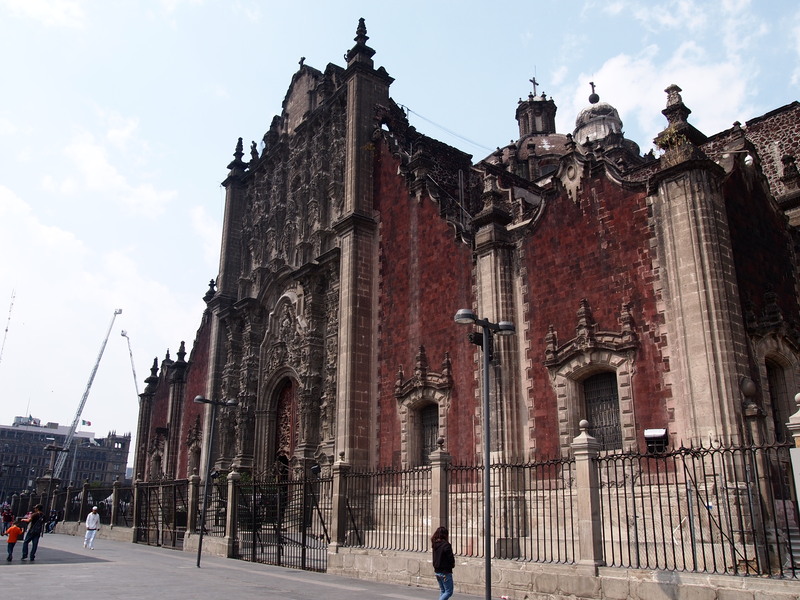 Just outside of the Templo Mayor site, and potentially still covering part of it, is the Catedral Metropolitana. 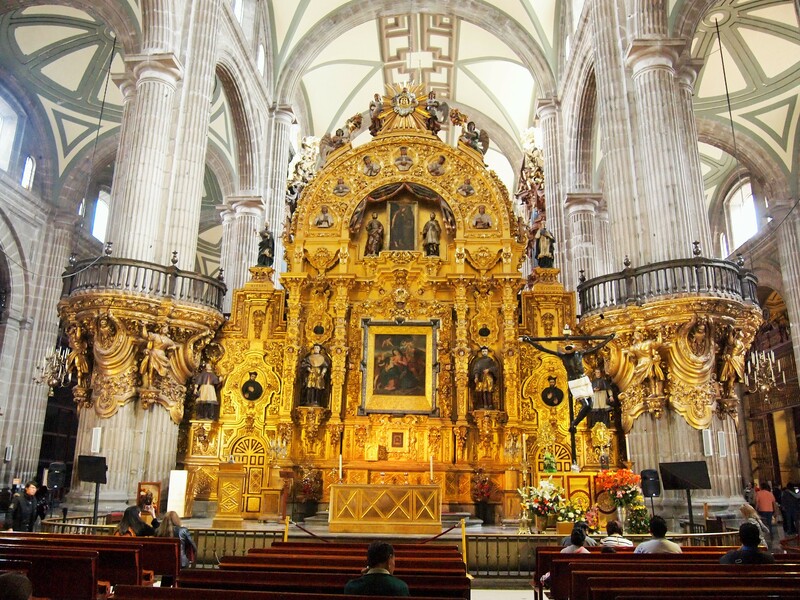 A cathedral was first built on the site in 1524 but the current structure wasn’t started until 1553. 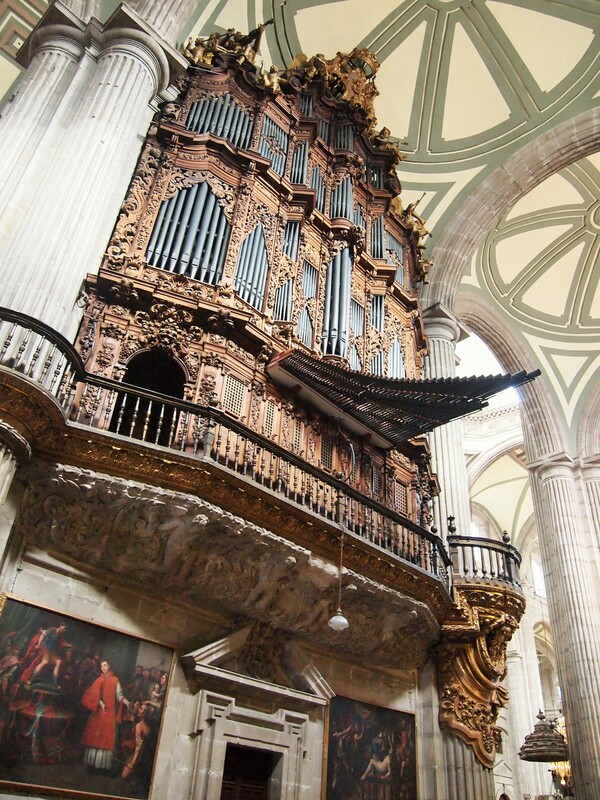 It took a whopping 240 years for the cathedral’s completion. 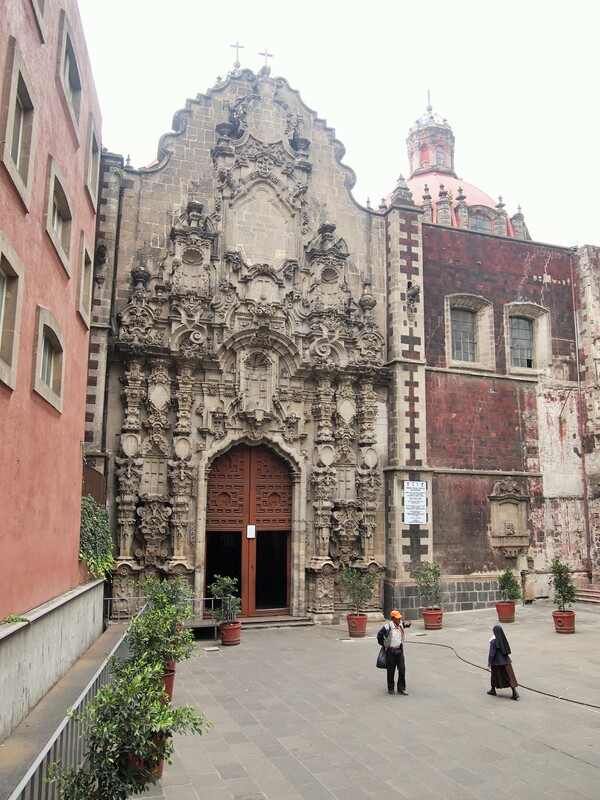 Next to the cathedral is the Sagrario (tabernacle) which was built in the latter 1700s and has a gorgeous stone facade surrounded by red volcanic rock called tezontle. 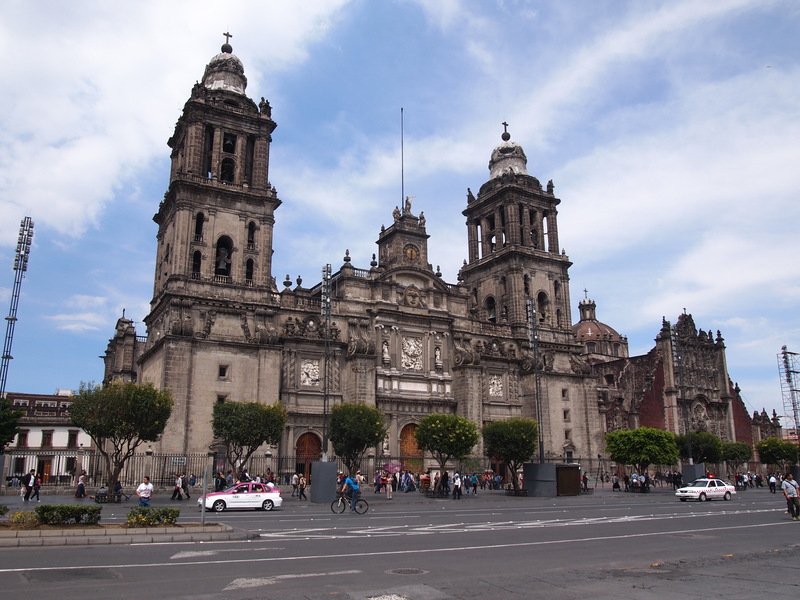 Across from the Catedral Metropolitana is the Zócalo, also called the Plaza de la Constitución. 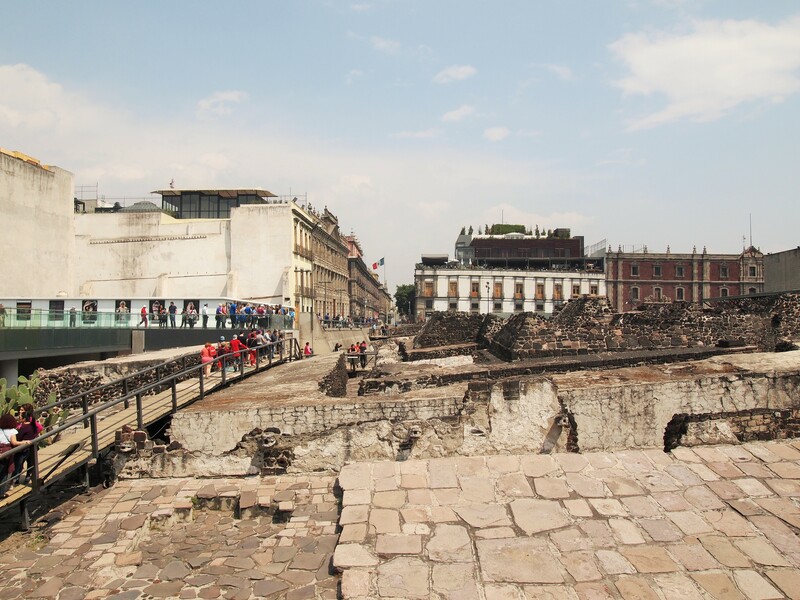 Ironically, the same large plaza was an important part of the city of Tenochtitlán whose inhabitants used it as a site for celebrations, rituals, and even a market. 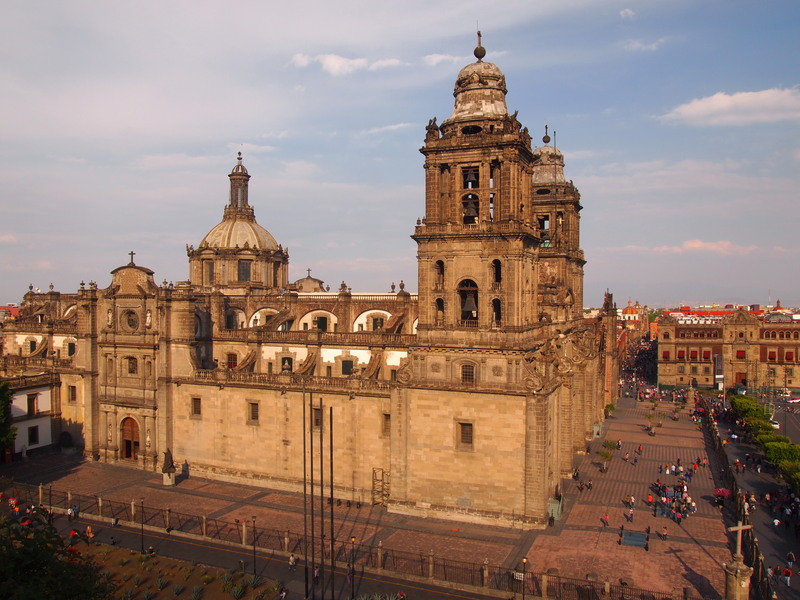 The Spanish retained the site as the central plaza for their new city calling it Plaza Mayor throughout the colonial era. 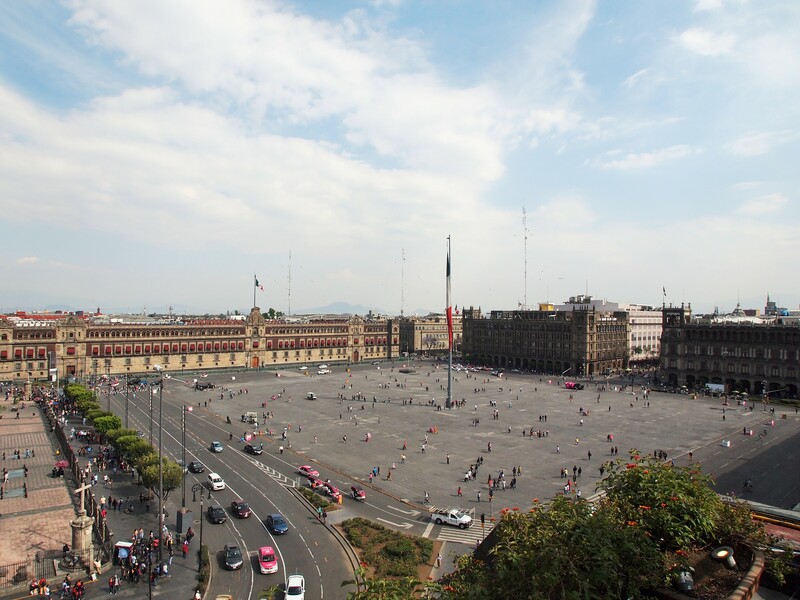 The Zócalo has remained a significant landmark in Mexico City. 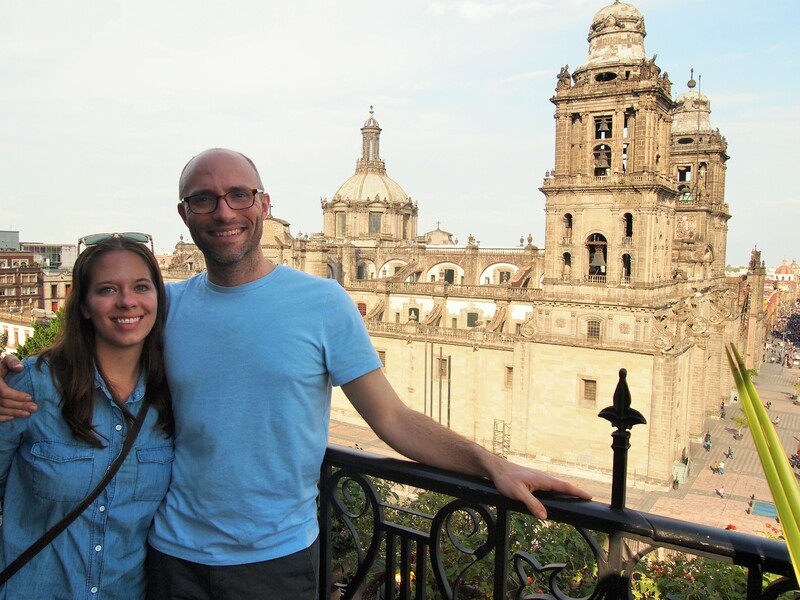 When we first visited on Sunday, the plaza was home to an enormous car show of some kind. We didn’t even venture across the street; there were so many people. 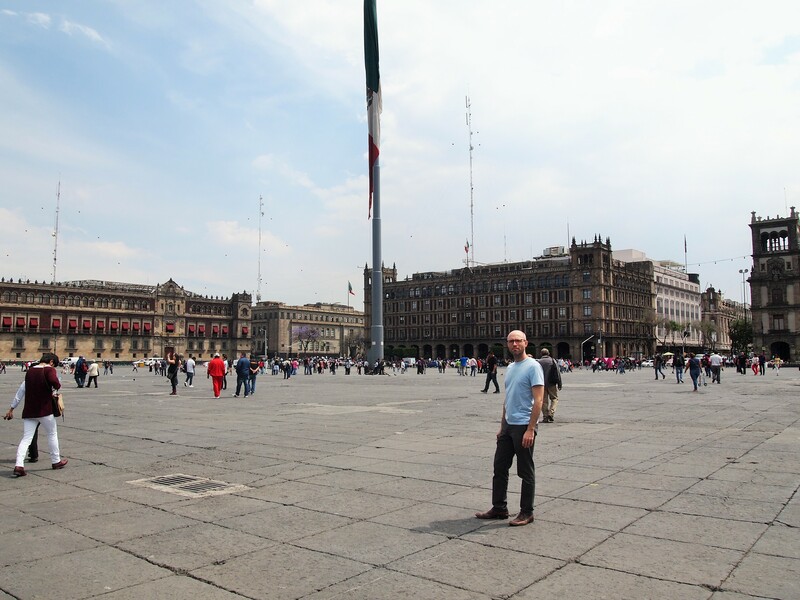 For our second visit on Friday, the Zócalo was empty, with plenty of room for tourists to walk around and admire the surrounding buildings. 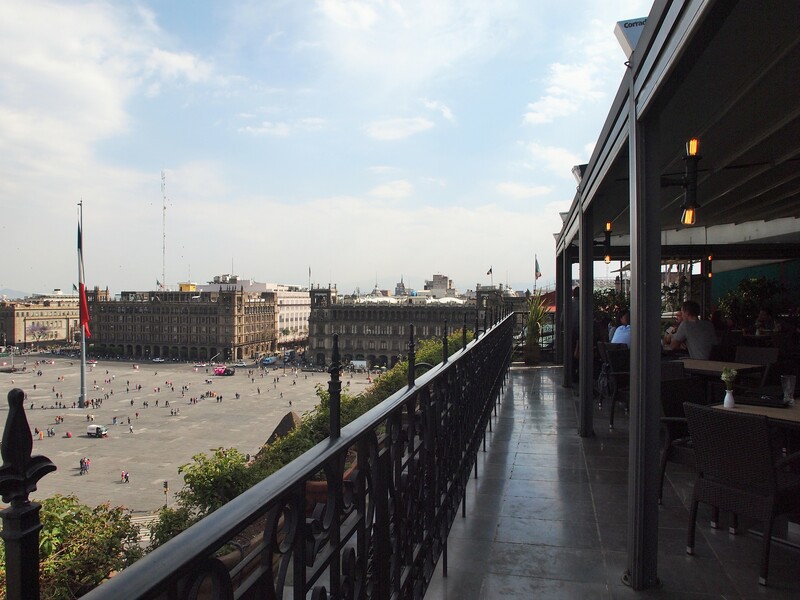 We also decided to have drinks and a snack at Balcón del Zócalo which has a 6th floor terrace overlooking the Zócalo. 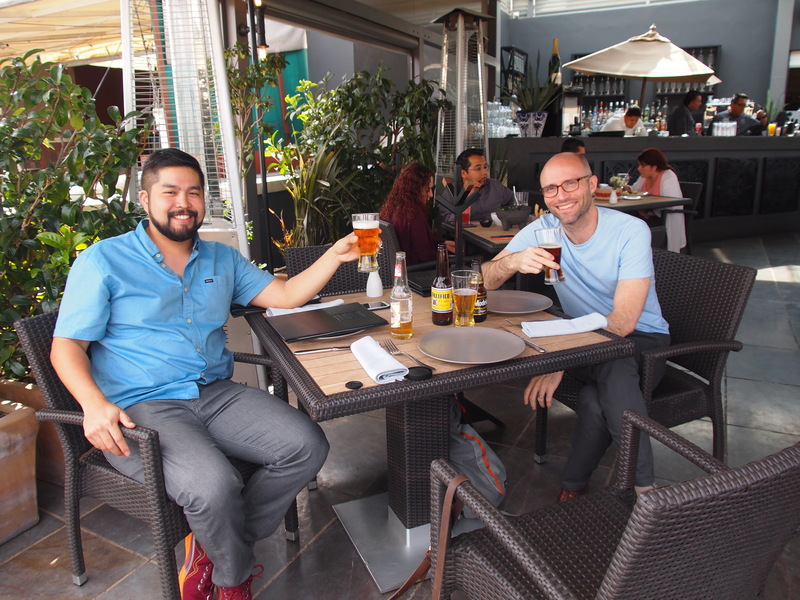 Balcón is a little on the fancy side, but it was perfect for some Mexican cervezas and guacamole. Somehow we got a prime spot at the front of the terrace and thoroughly enjoyed ourselves. 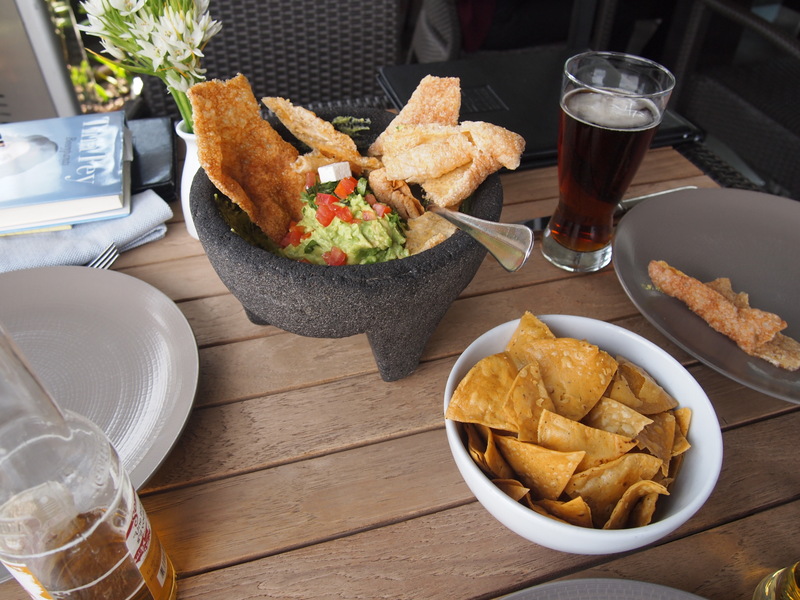 The weather was perfect, the sun was out, the drinks were cold, and the guacamole had cheese in it – perfection. 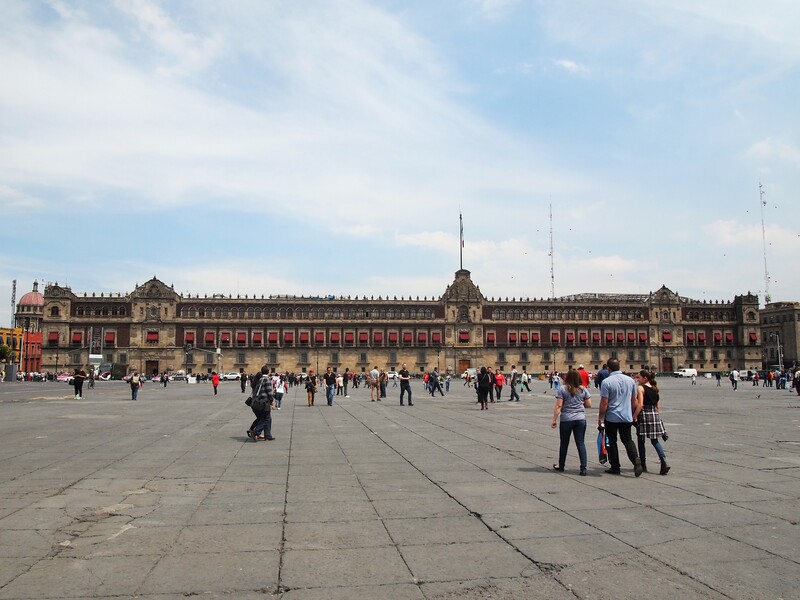 Finally, on the eastern side of the plaza sits the Palacio Nacional. 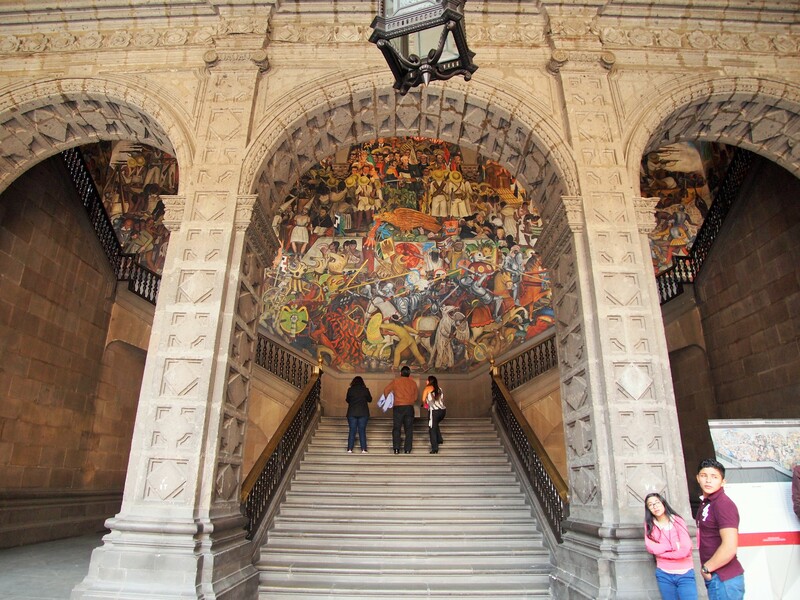 Originally built as a palace for Hernán Cortés, it became the official seat of government after Mexican independence. 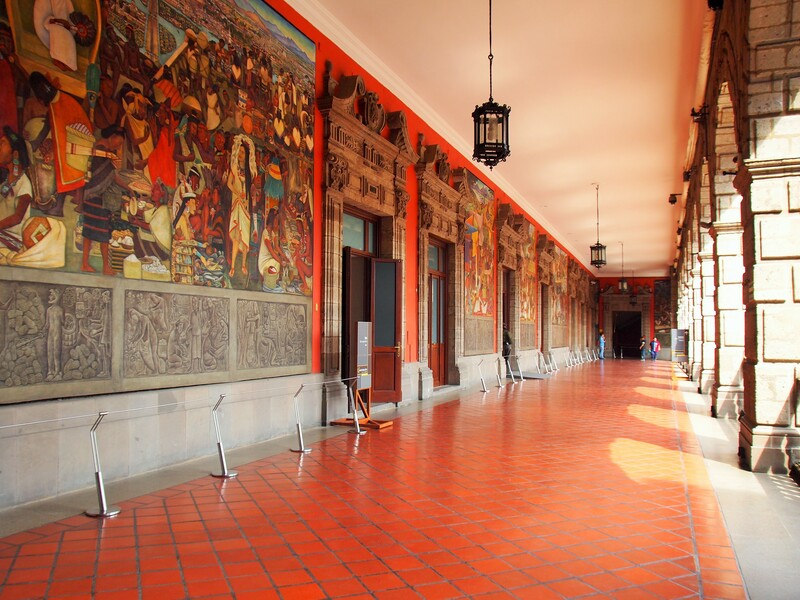 Visitors can tour the palace free of charge, but each group must leave at least one ID as collateral. We were able to leave Zach’s Utah driver’s license. 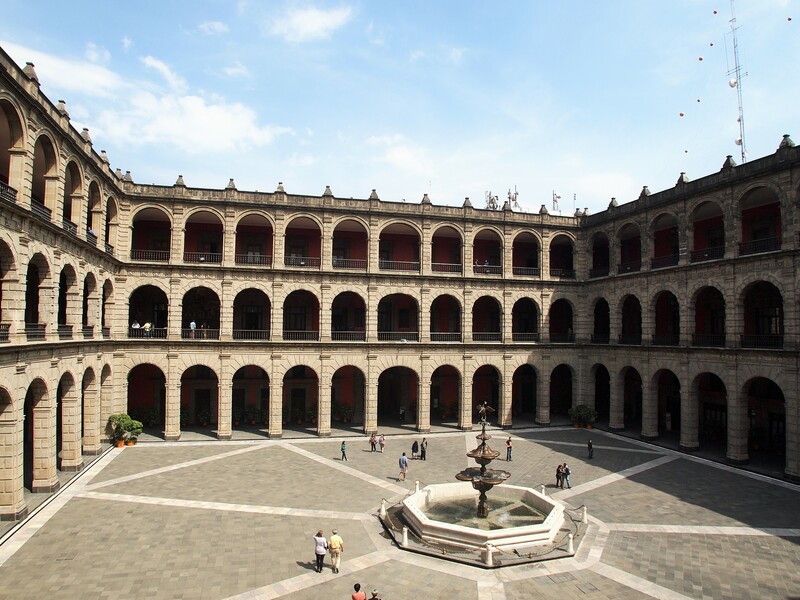 From the outside, the palace doesn’t look like much, but on the inside it’s a beautiful collection of courtyards. 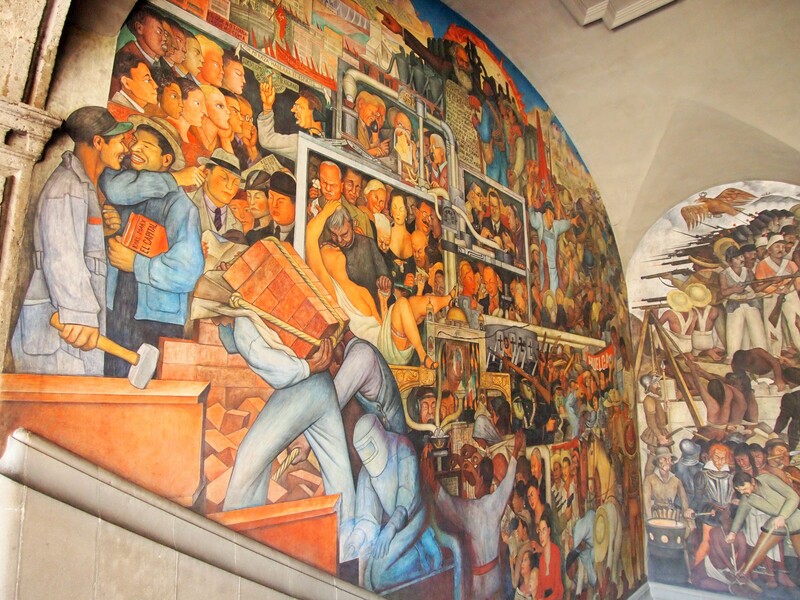 The true reason most people visit (my primary purpose as well) is to see Diego Rivera’s murals. 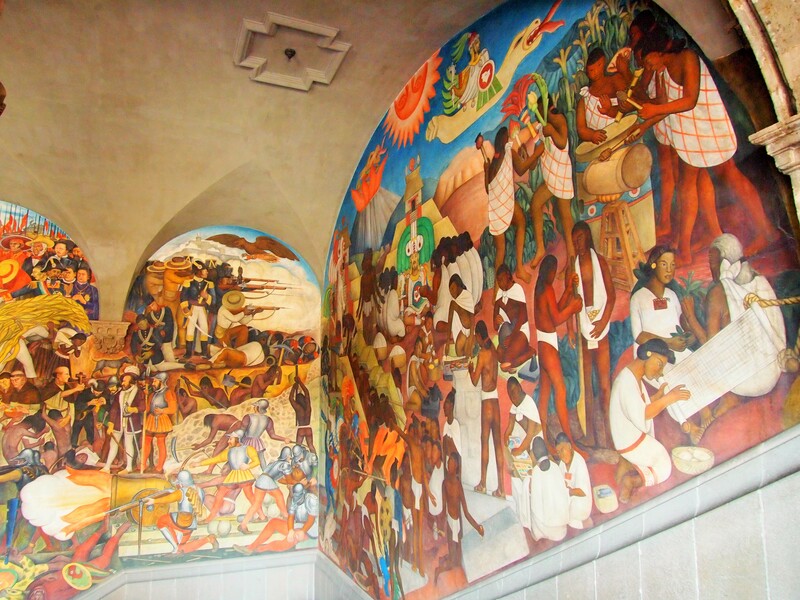 Inside a western courtyard, on the wall of a stairway, Rivera painted an enormous mural depicting Mexican history starting with its pre-Hispanic origins, going through the Spanish conquest to Mexican independence, and the future ahead. He began painting in 1929 and worked off and on until it was finished in 1935. It’s such an impressive work of art; it’s difficult to even wrap your mind around it, much less capture the grandeur with a camera. Truly, none of my photos even come close to expressing the utter devastation one feels when standing before the stairway with a cacophony of color before your eyes. It’s spectacularly humbling. 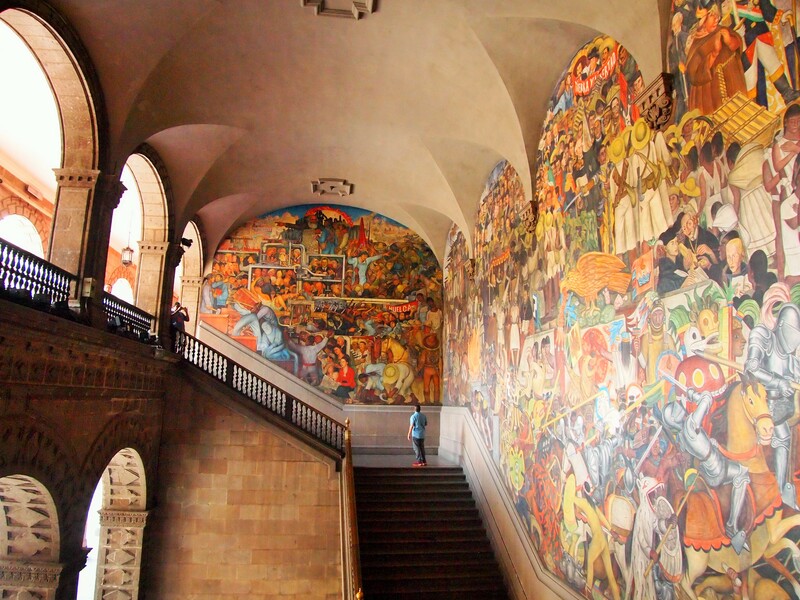 Once you manage to pull yourself away from the stairway, you realize there are more murals on the second level. 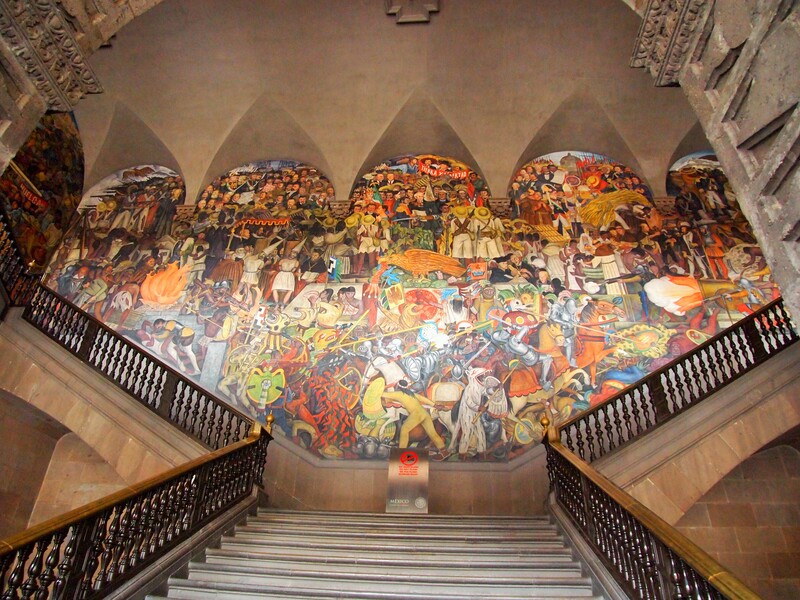 Originally intended to surround the entire second floor, the murals go only half way. 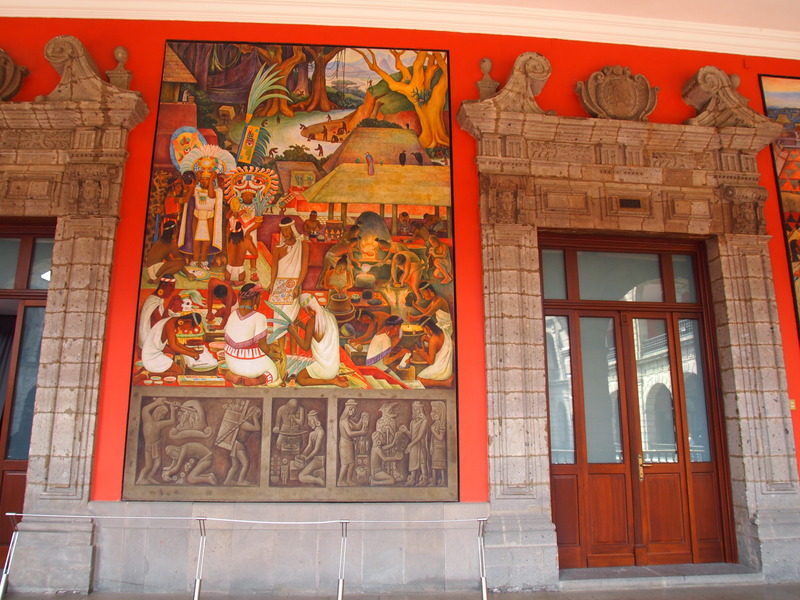 Rivera began these paintings in the 1940s and finished the last one in 1951. 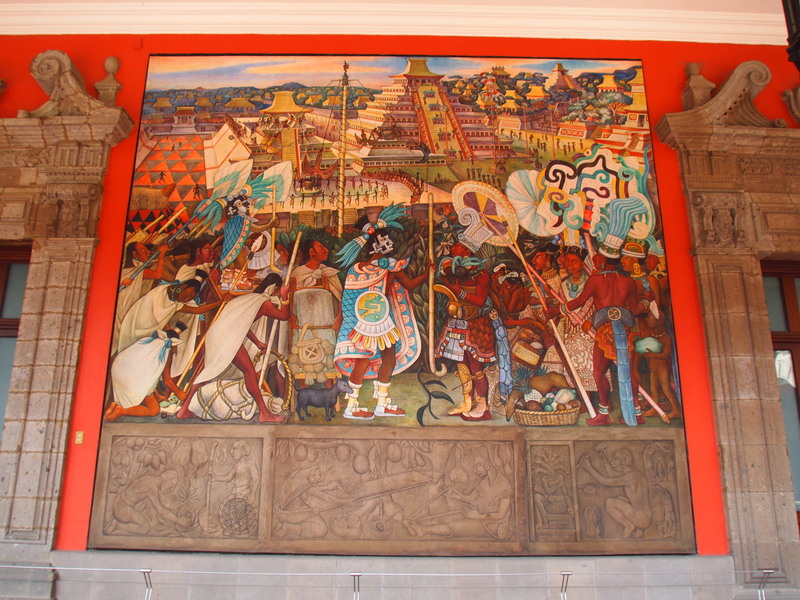 Here he depicts an idealized version of the pre-Hispanic world of Mexico showing Tarascan, Zapotec, Totonac, Mexica people while also showing the natural resources they cultivated – rubber, corn, cocoa, agave, maguey, etc. Under each painting is a grisaille (a method in which the painter uses only shades of gray) which relates to the larger image. Again, the detail of each painting is stunning. 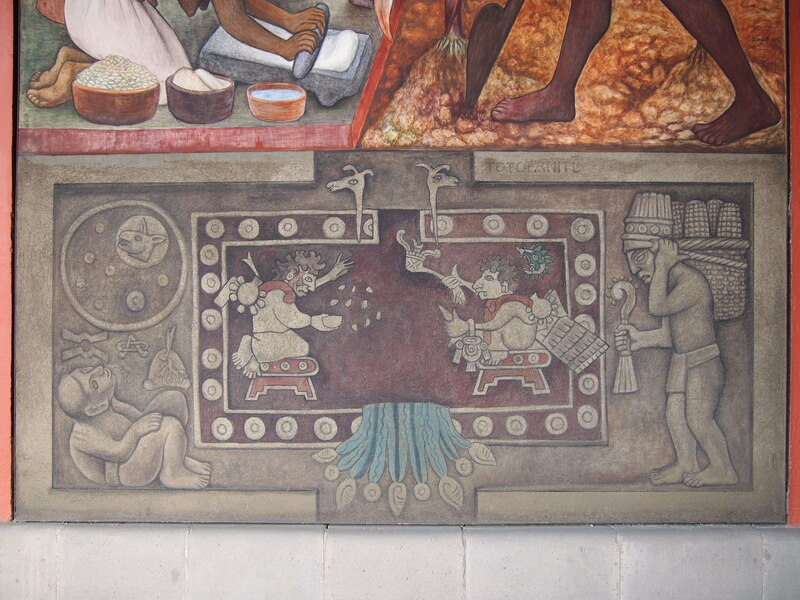 I love that each painting contains a rich, full story about its figures and their culture. 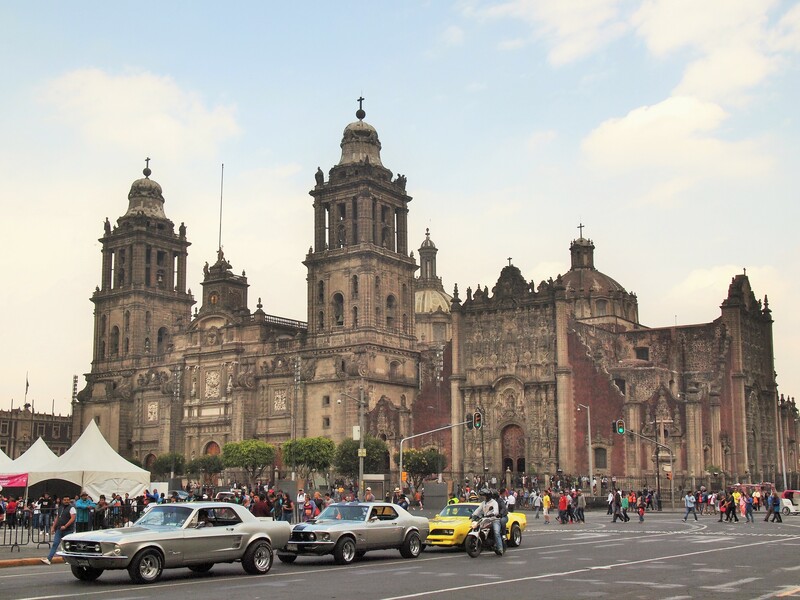 The streets surrounding the Zócalo retain the colonial style the Spanish brought with them. 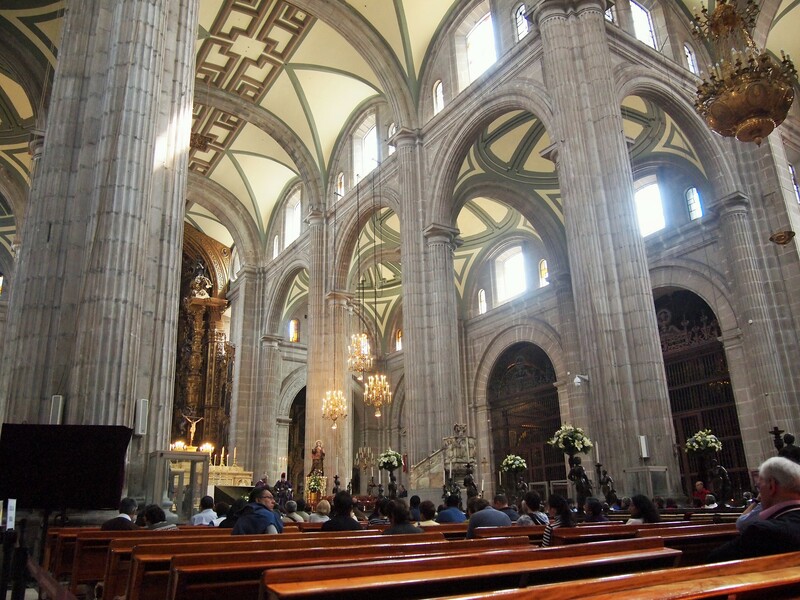 The avenidas are cobblestone, the architecture is beautifully baroque, and yet it feels uniquely Mexican. 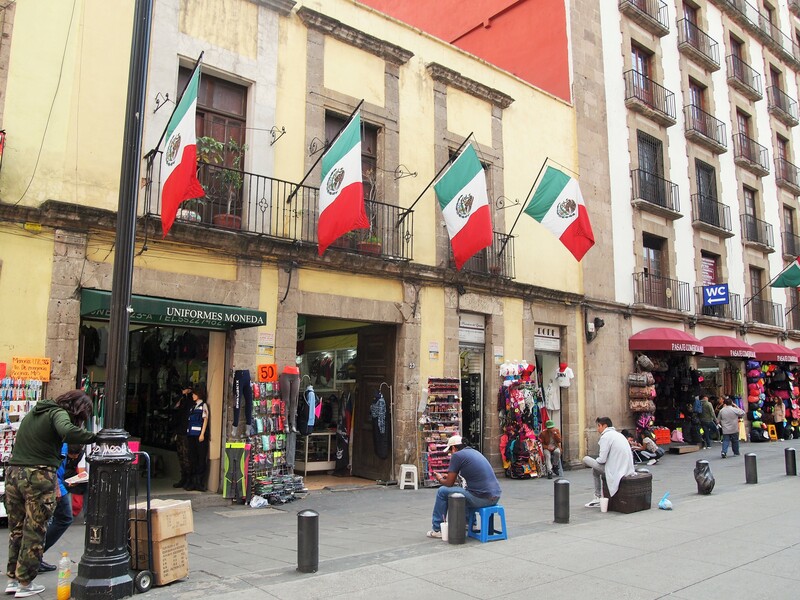 The names of the streets reflect Mexico’s history with avenues like Cinco de Mayo and Francisco Madero. 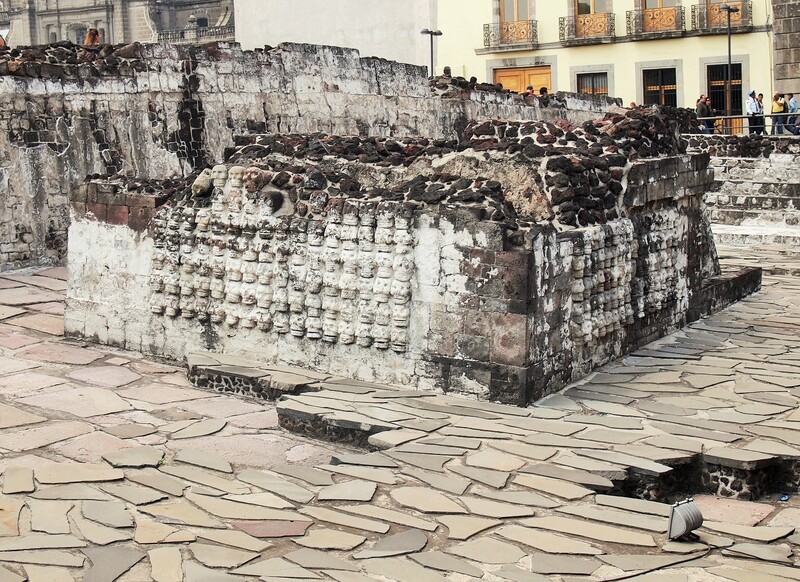 There are also lots of Nahuatl (the language of the Mexica) words sprinkled throughout the city. 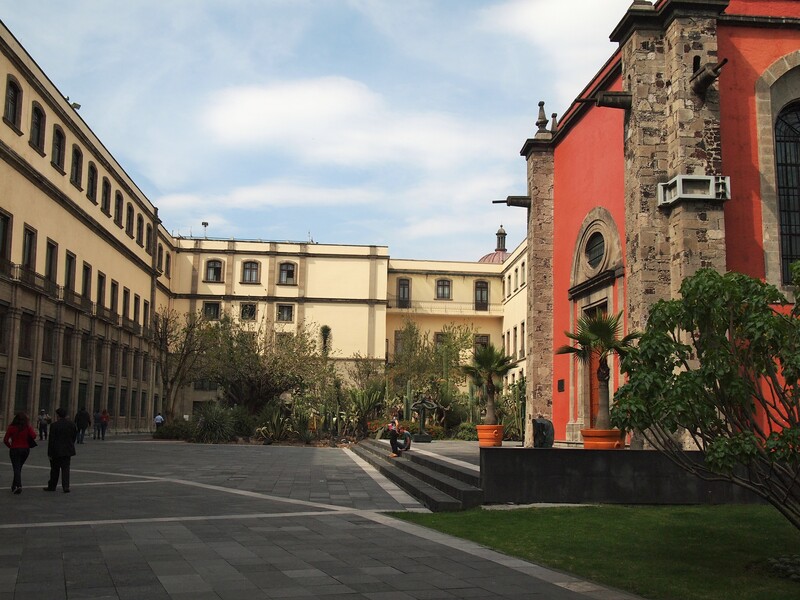 Even the warm, earthy tones of the buildings relay the city’s Mexican-ness. 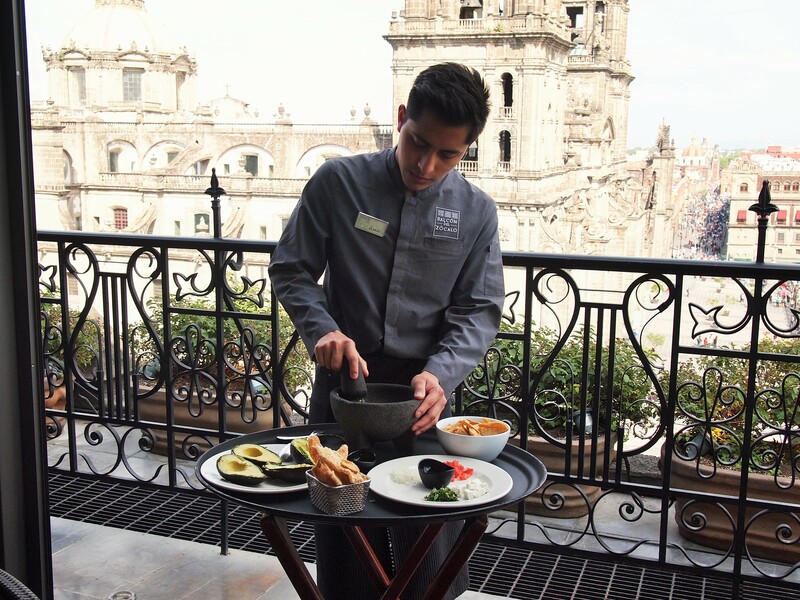 The Centro has its own magic slightly separate from other neighborhoods in the city. 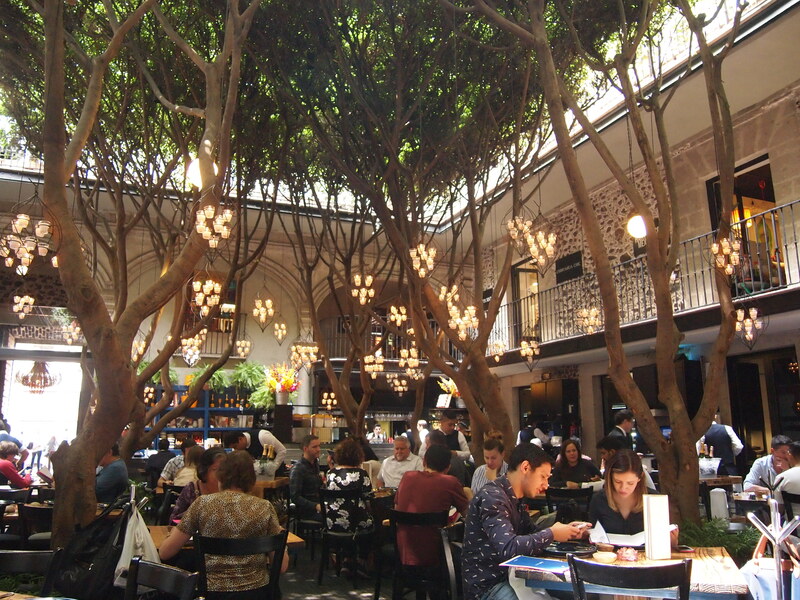 Zach and I ate in the courtyard of a colonial-era palace at Azul Histórico where the tables were shaded by potted trees and candles dangled from limbs. 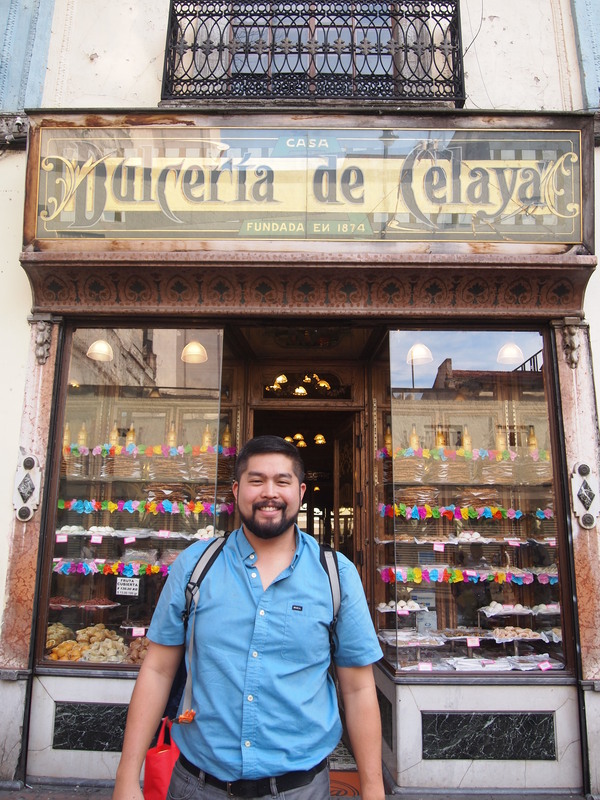 We stopped by Dulcería de Celaya, which has been in business since 1874, for some goat-milk caramels. 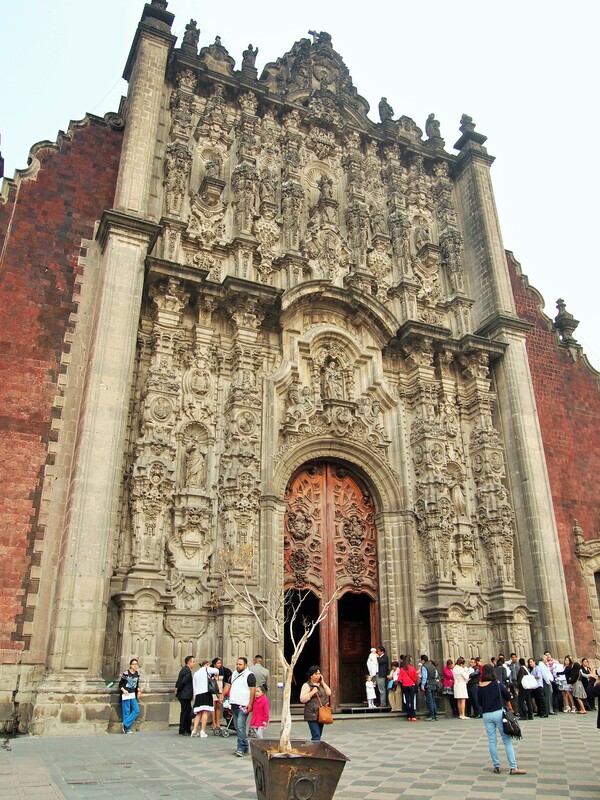 We strolled along a pedestrian avenue crammed with people and took refuge in the courtyard of a church across from the Casa de Los Azulejos. 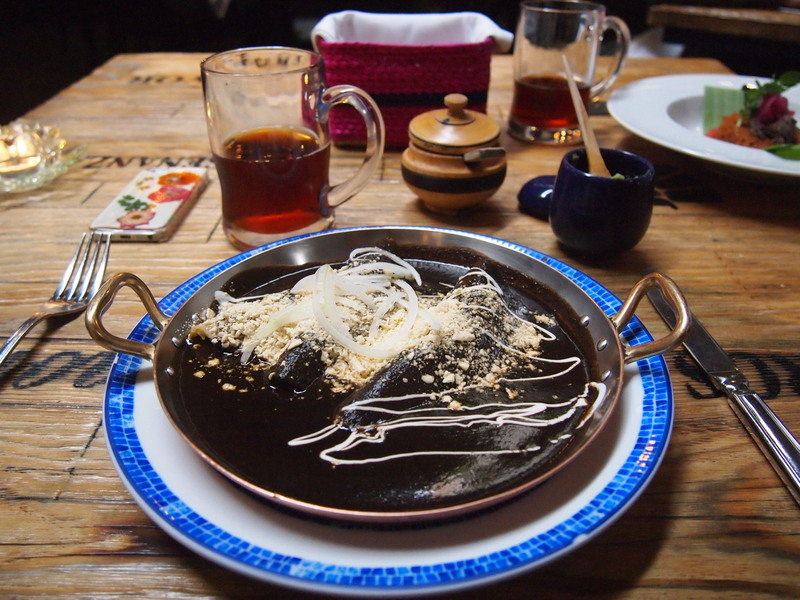 Zipping through the narrow one-way streets of the Centro after the rain, our Uber driver, distracted by his food-centric conversation with Tim, splashed through a puddle and girls’ screams echoed off the walls behind us. 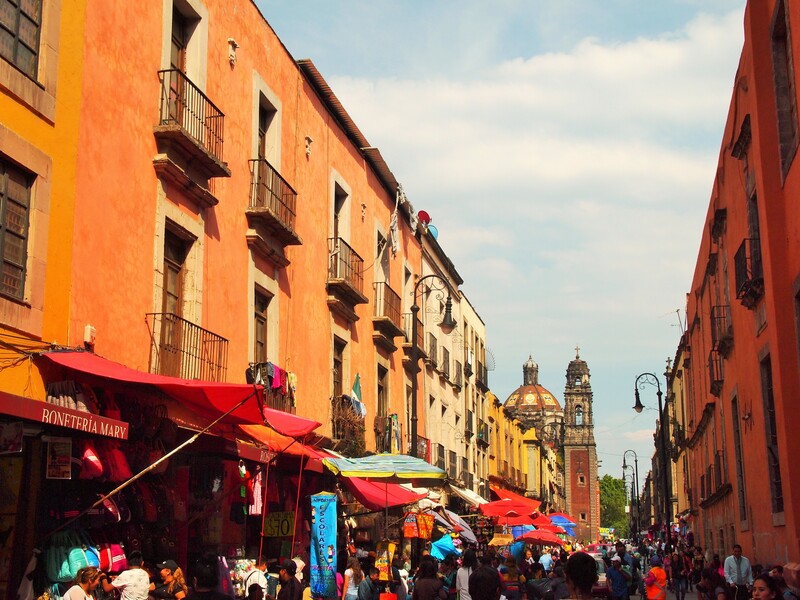 There’s just something about the close proximity of the streets, shops, people that lend the Centro its magic.